Road safety is a major concern in modern society. Increasing driver´s skills and expertise and promoting economic driving are fundamental aspects to reduce traffic accidents and the environmental impact of vehicles. 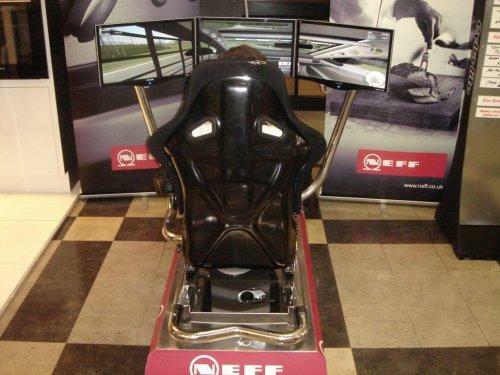 This simulator is great for sporting, driving and environmental corporate events. 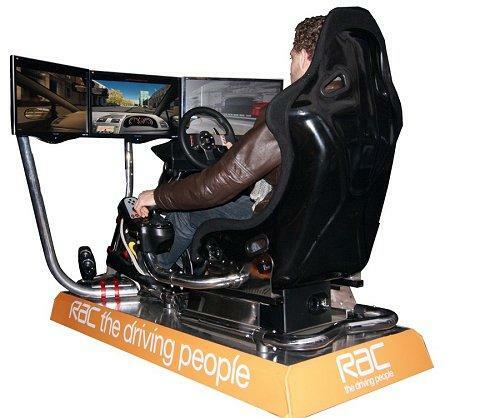 From the use of a full range of driving controls – steering, clutch, brake and accelerator, manual or automatic gears, plus the ancillary controls such as indicators, lights, horn and many more options, it lets you drive freely through more than 80 km of totally realistic environments of any kind: cities, mountain roads, highway and so on. This driver training simulator package offers a ready to operate system incorporating the world-renowned Simax software. It is possible to practice with many car models. Each model faithfully recreates all the characteristics of its real counterpart and provides a highly realistic experience using the different safety systems, such as ABS, traction and stability control, etc. – Easily save your organisation 15% or more in fuel costs through easily applied driving techniques. – Improve driver awareness and hazard perception. – Benefit from lower insurance premiums. – Benefit from lower maintenance costs. The various Eco Driving Simulator exercises can be adjusted in time or even available fuel to limit the time on the simulator. We can run the event as a competition which often helps to focus the participants’ attention. We will provide a supervisor who will be with the simulators throughout the event to explain the objectives, basic controls and to advise on techniques that will improve every driver`s fuel economy by up to 20% in everyday driving as well as improving their hazard perception awareness. The software consists of different exercises which are split into three difficulty levels: basic, medium and advanced. 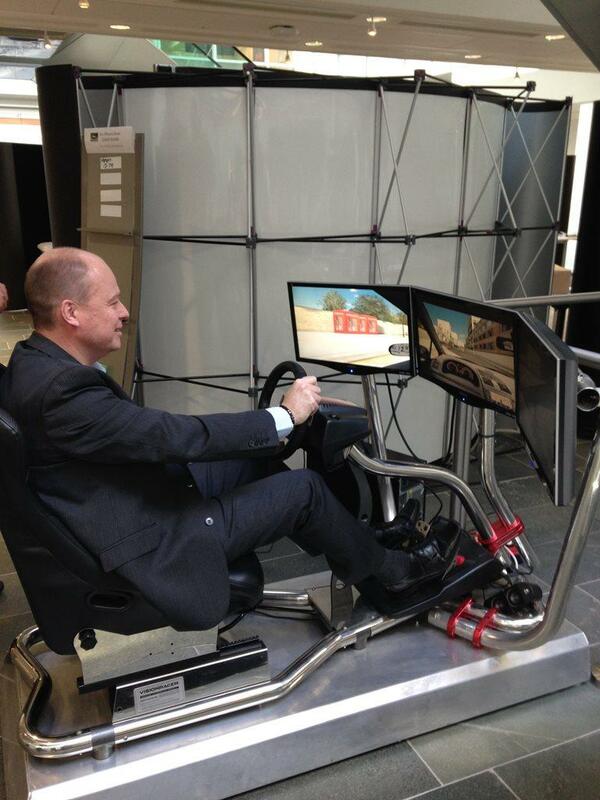 After assessing the amount of time on the driving Simulator afforded to your delegates we will suggest a format. It is fair to say most of our clients prefer to offer a taster session to drivers of around 5-6 minutes per drive. This gives us the opportunity to introduce some key techniques that will realistically offer drivers and fleet managers up to 20% savings on fuel economy, decrease servicing and maintenance costs and improve awareness and road safety. In these 5-6 minute sessions, typically we will present an eco-comparison drive of 2 x 2 minute drives in an urban environment. The first drive will automatically set the car up in a non-economic way (low tyre pressures, etc.). After your first free-drive the program will display your distance covered, CO2 emissions, fuel usage and average MPG. The Eco Driving Simulator program then illustrates on screen the check list (seven in total) to optimize eco performance. The 2nd drive begins in the same urban environment. With audible instructions in the program augmented with tips from our trained supervisors, your delegates will see their improved performance illustrated in a comparison of the 2 drives at the end of the session. Everybody likes a competitive edge to the event. As such we can record the MPG/CO2 results/percentage increase in economy or 2nd drive results as part of a team or individual score. This will be posted on the provided Top Gear-style leader board. The basic section contains two exercises. The first of the training exercises will take you through the basic skills needed to drive a manual transmission car; acceleration, gearbox and clutch control. Once this is completed, the following levels will then guide you through common parking manoeuvres, navigating through a city and motorway driving. The medium section contains two training levels. Firstly, you’ll be shown how to use a stop & start device, and also how it helps to reduce CO2 emissions and fuel consumption. The second task is a challenge designed to practice eco driving. The objective is to reach a certain distance with a very limited amount of fuel and time. You can then, using the skills you’ve just acquired from the training levels, practice in four different driving environments: inner city driving, mountain road speed driving on a race or test track and a Dual carriageway with and without traffic. – Drive for two minutes in non-eco friendly car, i.e. unnecessary boot loads, low tyre pressure, open windows, air condition left on and aerodynamic resistance due to peripheral accessories, i.e. roof racks etc. – Drive for two minutes in a car with all aforementioned setup problems removed. – Drive for two minutes in a hybrid electric car. Once chosen levels have been completed, you’re shown the differences in fuel consumption and CO2 emissions for each of the respective vehicle setups. The second level within the advanced section is emergency braking practice, with and without ABS, on a low adherence surface. Available training includes ECO-Driving Exercises, Road Safety & Learning to Drive. This driving simulator exercise will show you the most basic manoeuvres required to drive a manual car. You will learn how to use the clutch, set gears and drive at a very low speed. Follow the on-screen instructions. This driving simulator exercise is designed to let you practice free driving in highways and motorways, with no traffic. This driving simulator exercise is designed to allow you practice driving in urban environment, with no traffic. You will find single and double lane streets, one and two way roads, roundabouts, junctions, etc. This driving simulator exercise allows the driver to practice the most common parking manoeuvres, by driving through a multi-level car park. Parking in different places as many times as you like until you are confident with the manoeuvre. In this driving simulator exercise you will practice driving in a mountain road, interacting with some cars out there. The road has very slow curves, so drive carefully and at a low speed. This driving simulator exercise is designed to allow you practice free motorway driving in the night, with no traffic surrounding you. This driving simulator exercise will allow you to practice free driving through an open, urban environment, with traffic. This driving simulator exercise is designed to let you practice free driving in highways and motorways, with traffic. In this driving simulator exercise, you can practice sports driving with a free drive through a speed track. In this driving simulator exercise you will practice driving through a winter mountain road, with variable road conditions, including parts with ice, snow, water, and with non-optimal weather, like snow and fog. Pay special attention on how the car behaves on low adherence road surfaces, and then try to learn how to react in those situations. It is also interesting to understand the effect of the ABS when braking. This driving simulator exercise is designed to show you how the car´s behaviour in emergency braking conditions, through a low adherence, surface, and with or without ABS (Anti-lock Braking System). Start your engine and, with the ABS on (by default) drive straight towards the wet area in front of you. Accelerate as much as you can and when you reach the curve described by cones, fully press your brakes and try to turn your car through the curve. Observe the braking distance and that the car has some steering capacity, allowing you to avoid the cones. Then push the Recover Car button, disconnect the ABS and repeat the manoeuvre to see the differences. This driving simulator exercise is designed to allow you practice free motorway driving in the night, with traffic surrounding you. 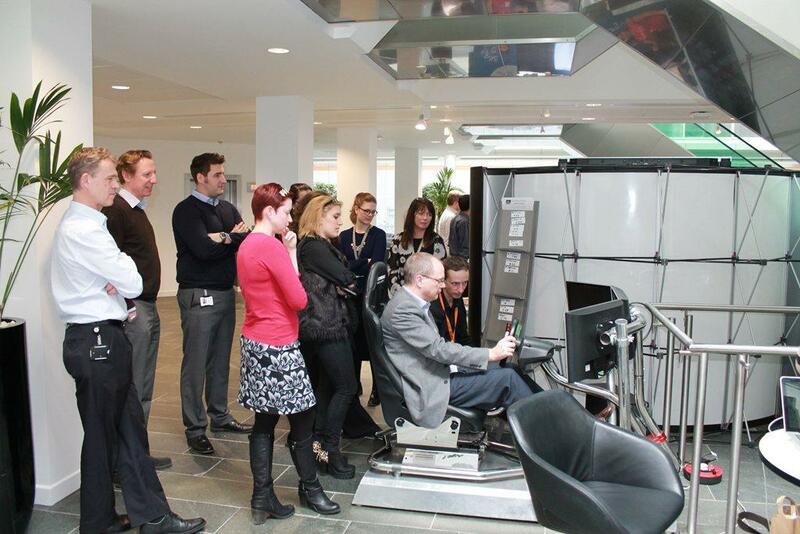 This driving simulator exercise is designed to monitor the effect of tiredness in driving. You will drive through a circular highway, with road works on the extremes which force you to turn back. This way, you will stay driving for a long time. Some traffic incidents will appear from time to time. The simulator will monitor your reactions to such incidents. This Eco-Driving exercise is designed to show how a start and stop device works, and how it helps reducing CO2 emissions and fuel consumptions when the car is stopped, like in traffic lights. Please notice how the engine stalls and activates the eco-mode when you stop the car, set neutral and release the clutch. When pressing the clutch pedal again, the engine starts automatically. This Eco-Driving exercise is designed to practice ecological driving. The objective is to reach a certain distance with a very limited amount of fuel and time. You will find no traffic. To be able to finish the exercise, please choose a diesel car. In this Eco-Driving exercise you will have the chance to test the influence of the start and stop system in fuel consumption, by driving a Toyota IQ, with that system cancelled in the first run, activating it in the second, and showing a final report. This Eco-Driving exercise is designed to practice ecological driving. The objective is to reach a certain distance with a very limited amount of fuel and time. You will find some traffic. To be able to finish the exercise, please choose a diesel car. This Eco-Driving exercise is designed to practice ecological driving. The objective is to reach certain the top of the mountain road, with a very limited amount of fuel and time. To be able to finish the exercise, please choose a diesel car, and do your best practicing concepts like engine braking, to avoid unnecessary fuel consumption. This Eco-Driving exercise is designed to practice ECO-Driving in an urban environment, testing different car configurations. First, you will have a 2 min. run with a manual car, and a wrong setup, as depicted at the beginning of the exercise. Next, car setup will be fixed and you will have the chance to improve your eco-driving results. Lastly, you can try a hybrid car in a third run. 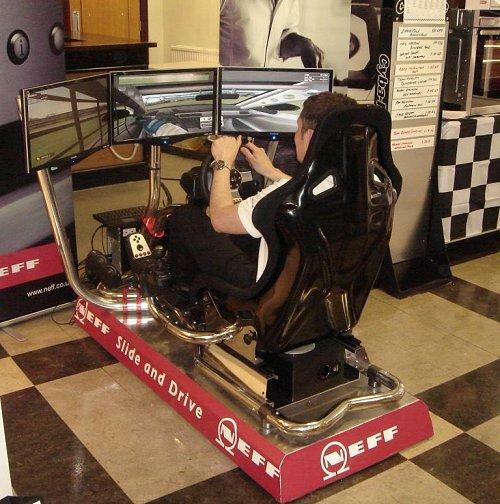 The Eco Driving Simulator is usually hired for 6 hours. Use: indoors only unless waterproof cover is arranged – if required.